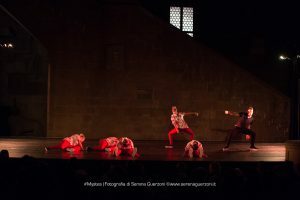 Mystes is the name of the Florentine Dance Company, founded and choreographed by Gigi Nieddu since 2002. Unique for its versatility that characterizes it, in all its works are clear the roots of Hip Hop meant as urban dance, but simultaneously looks to look over stylistic and musical experimentation. Just for these features, Mystes can propose their Hip Hop vision in completely different environments: from simple street shows, to discos, to sports events, to choreographic contests, to the presentation of entire shows at international festivals such as the Florence Dance Festival, where the Mystes have performed in many years. Mystes is the word from which the word mystery comes to life, which was used in ancient Greece to indicate the initiate the rituals mysterious. In mystery religions the individual entered into a direct relationship with the divinity, waiting for salvation after death. Hence the obligation of an initiation rite (mystes in Greek: the initiate), without which he was welcomed among the “faithful” of God. The rites took place mostly at night, to emphasize the separate character than the official religion and included sacrifices, banquets and dances that were intended to bring the initiate to purification and renewal. The adepts belonged to all social classes, but mostly to the lower classes, and there were allowed women and slaves, namely those who the official religion held at the edge of the cult. Affiliates were envisaged as a community “other”, where they fell or recede social hierarchies; During these rites pledge came up to a real state of Ecstasy and a total abandonment of the mind. Starting from this basic concept, the choreographic project Mystes tries to dig into the deep abysses of the mind, giving much room for improvisation and the expressiveness of each dancer. The representations are sometimes also told in a harsh, because they evoke mental paths heavily introspective. The choreography of these narrations strongly emotional system has its roots in Hip Hop, understood in urban key, but are aimed towards a strongly contemporary style and musical experimentation and contamination. The urban dance, then, is the basis of all this, but in a different way from how it is often represented in a context relevant to the show, by binding to electronic and experimental music, going beyond the usual clichés.